A red lynx. We have the sleeker, brown lynx here on the yard. The sounds of swans flying overhead, blackbirds bickering on the lawn and cranes calling out to the world that they have arrived. These are the best bit of spring to come. We still have some thick, hard snow on the ground, but we are also seeing some of the lawn. That's where the arriving birds gather, to fight over this summer's nesting areas. You would think the principal of "choose once you get there", would apply. Mindy, Mandy, Molly and My are slowly stepping away from the stable yard and trusting that the last of the snow is not going to attack them. Half a meter of snow is fine, according to our dear sheep but when it's melted down to a thin sheet of frozen slush it's not to be trusted. Only the longing for some brown, slightly slimy grass can make them venture out to the other side. Once there, they start grazing and the look of pure happiness on their faces is another joy of the "almost spring time." The hens are laying eggs like it's going out of fashion and we are knee deep in omelets and boiled eggs. Ebba the dog loves an egg yolk from time to time so that helps us out a bit, with our egg surplus. Trisha the hen is now broody and has started collecting eggs for herself in one of the nests. She sounds like a faulty smoke alarm if anyone gets too close to her and her collection of own and borrowed eggs. Dear husband is stacking the chopped wood accompanied by Ebba. On one side of a small apple tree you can find a very professional looking stack of fire wood, on the other side you will find deep holes dug in a neat row. Ebba seems to have read A. A. Milne and is now trying to catch a Heffalump. You really must remember where the holes are, when walking in the dusk or you might end up with a sprained ankle, or worse. (At least the digging has not yet reached bear trap proportions). Ebba is full of spring light and new energy and pulls even harder on the lead, when out walking. We look like water skiers, trailing behind our engine-like dog, discussing whether days at school would do her some sort of good. We really must make her stop pulling on the lead as it can't be good for her and it certainly isn't good for our backs. My arm muscles are starting to look quite toned, though, so that's something come the short-sleeved summer season. The clocks changed today and that means that I will spend a week being a complete acorn. I can't get my head around this changing from winter to summer time malarkey, although you would think I've had enough practice, by now. Dear husband knows to expect it but he still finds it amazing that it throws me sideways, every year! So, I'm a knocked over acorn, for a week. 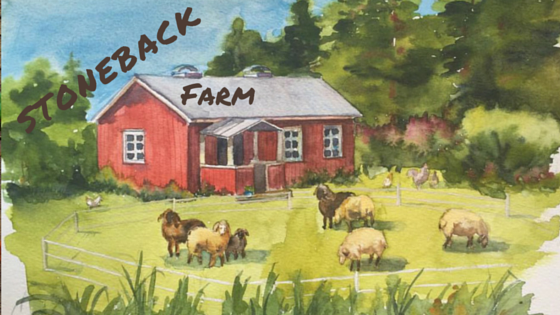 The hens follow the sun, the sheep follow their tummies for food and Ebba follows her sleep pattern. I follow them so we could stop using clocks, altogether. Or maybe not. I just should roll through this week and hope to meet up with very few squirrels. The hawks are arriving, from wherever they have been, this winter. Mindy, our white foghorn sounding sheep has called to warn us, whenever the feathery visitors have been close by. Without Mindy's carrying voice we would seldom know the goings on, in the yard. When the sheep went out a little later than normal, one evening and Mindy called out her warning call, I thought it was hawks, yet again. 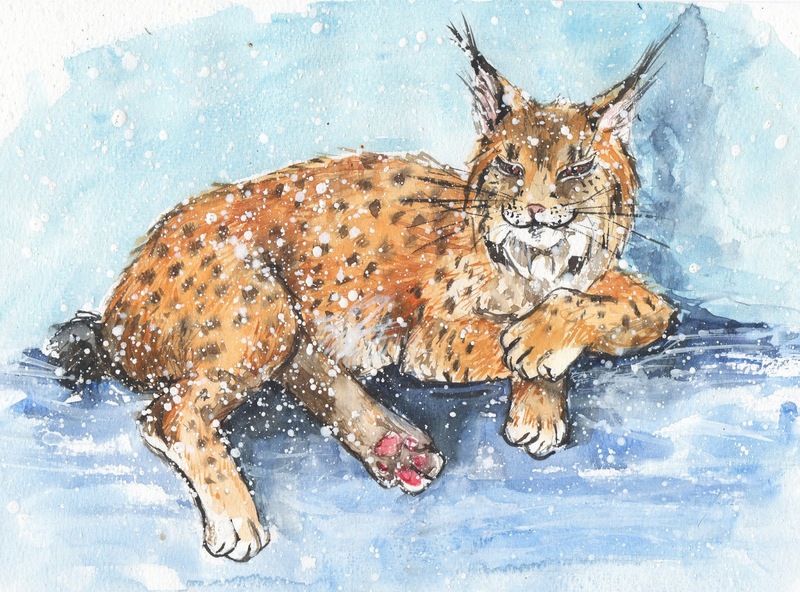 I did run out to check and got really surprised to spot a huge Lynx, strolling over the field towards us." No stress, no hurry, just out for a walk", was the image the big cat was sending out. The dusk added to the whole magical setting and you could almost think that it was a puma arriving. Our dear sheep stared so intently at the wild animal approaching that I feared they would have a collective meltdown, there, on the spot. Dear husband and my dear sister, who was over for the weekend, got to enjoy some wild animal safari from the kitchen window. They both saw their first Lynx and a mighty fine specimen, at that. My sister's comment about it being a tough life for hens, living where we do, felt very true at that moment. It's not a bed of roses for sheep either, if they meet a bear or a humongous cat on their treks. At least everyone sleeps indoors at night, all through the summer. It is fun, though, how I can get close to all sorts of wild animals, hanging out with our lovely sheep. Maybe my human smell disappears a bit, amongst all that wool, as our visitors seem to be quite calm about me being there. Do vegetarians smell more lettuce like? So now we have had the bear and the lynx and I've seen a wolverine so we all know who is left to pop in. Somehow, I don't fancy the thought of a wolf popping in, but that's the last of our bigger predators that we have not spotted over here. Let's hope it stays that way.